First introduced and described in the fourth edition of his Treatise on the Physiology and Diseases of the Ear (1831), John Harrison Curtis’ acoustic chair earned him national recognition as an inventor during the first half of the nineteenth century. The chair is a large library chair affixed with a trumpet alongside the chair such that the user is able to hear sounds from the adjoining room. The chair is intended for the benefit and use of the incurable deaf…one of the great advantages possessed by my Chair [is that] the person sitting in it hears at the opposite side from that at which he is addressed; thus avoiding the unpleasant and injurious practice of the speaker coming so close as to render his breath offensive and at the same time detrimental to the organ of hearing, by causing a relaxation of the membrane of the tympanum. 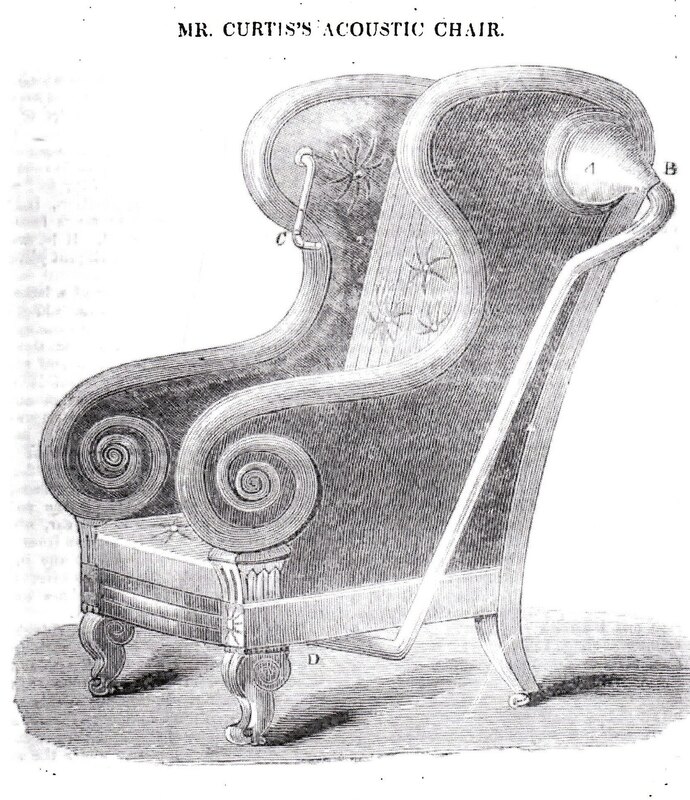 An engraving of the chair was published in the frontispiece of The Mechanics’ Magazine in 1837, praising the beauty of such an ingenious innovation. A model of the chair was eventually placed at the Royal Polytechnic Institution and at Adelaide-Street Gallery.